Cool, while Wilco was presenting a session at BriForum about free App-V tools, my colleagues Ment van der Plas and Ruben Koene released new versions of ACDC and the App-V Template with new features and to support App-v 4.6. App-V ADM template 2. Cool, while Wilco was presenting a session at BriForum about free App-V tools, my colleagues Ment van der Plas and Ruben Koene released new versions of ACDC and the App-V Template with new features and to support App-v 4.6. 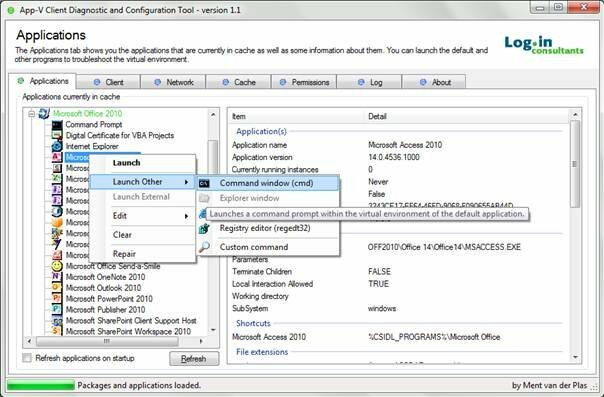 The App-V ADM template configures client setting for the App-V Windows Desktop Client and for the Remote Desktop Services Client. 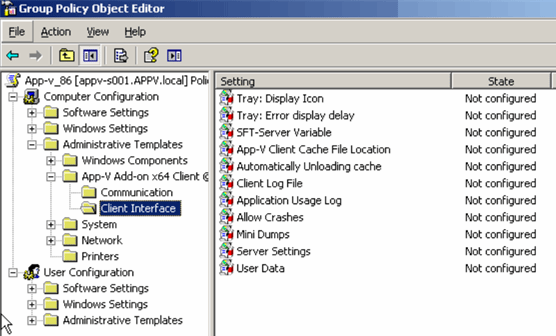 The ADM template centrally manages common client configurations by using an existing Group Policy infrastructure and includes settings for communication, client interface and permissions. The App-V Add-on ADM Template is an extension to Microsoft’s “App-V ADM Template”. Together, Microsoft’s and Login Consultants ADM Template allow a comprehensive management of various App-V Client settings. Virtual File System: This option has been removed because it is included in the Microsoft ADM. Require Authorization If Cached: This option has been removed because it is included in the Microsoft ADM.
Cache location: Changed to App-V Client Cache File Location and included VDI shared cache (read only FSD). Cache Size: This option has been removed because the cache size can’t be modified by just changing this registry key. Instead, you either have to flush/clear the cache by setting the “State” registry value to “0” before rebooting the client machine or you have to use Microsoft’s “App-V Cache Resizer Tool”. Global Data Directory: This option has been removed because controlling it by a GPO setting is not very useful. Tests showed us that changing only the Global Data Location through registry resulted in a “hanging state” of the App-V client. Preferably this setting should be changed through the Client Management Console. Configure settings that are not visible in the App-V Client GUI, such as "Predictive Streaming", "Allow Stream from File", "Max Package Age" and many more.